Potawatomi Bingo Casino is one of the most state-of-the-art gaming facilities in the Midwest. So it would only make sense for their new site to be built on one of the web’s most comprehensive, state-of-the-art development platforms. 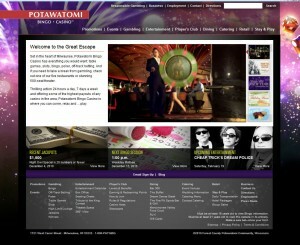 An all new version of Paysbig.com, the website for Potawatomi Bingo Casino in Milwaukee, Wisconsin, built on the Concrete5 development platform, was launched by Trivera Interactive on December 13, 2010. The project began with the strategic decision by the Casino to empower the managers of the many business units to update their own areas of the site with a tool that could balance power with ease of use. While Trivera has worked with several different content management systems, concrete5 was mutually determined to be the best choice for Potawatomi Bingo Casino’s new site. A relative newcomer to the CMS arena, concrete5’s array of powerful plug-ins, extensions and add-ons, plus an extremely user-friendly administrative interface made it an obvious choice. The new website is not the first major initiative undertaken by Milwaukee’s Trivera Interactive for Potawatomi Bingo Casino since becoming their primary web and interactive services partner early in 2010. The relationship began with a migration of all of the Casino's web assets to Trivera’s world-class hosting center. Trivera has also migrated and updated other online systems used by the Casino. While Trivera has developed hundreds of complex web-based applications for clients over their 15 years in business, with dozens built using various content management systems, the new Potawatomi Bingo Casino site was their most ambitious site to date created using concrete5. The wide and varying business units within the Casino include several restaurants, entertainment venues, bingo hall, off-track betting room, table games and slot machines. Trivera’s decision to use concrete5 to be the platform to bring all those business units to the website proved to be the right one as the project launched, fully functioning on the originally scheduled launch date, on time, on scope and on budget. Potawatomi’s web administrator Christopher Graham says: “I really am amazed how the Trivera team was able to take my mock-ups and bring them to life. Also, I was thrilled with their feedback, communication and forward thinking." Trivera President Tom Snyder added: “It’s amazing to see what happens when incredible talent, a proven process, powerful tools, mutual respect and hard work all come together. Located at 1721 West Canal Street, Milwaukee, WI, Potawatomi Bingo Casino is the Midwest's number one entertainment destination. With nearly 100 table games, 3,100 slot machines, 1,350-seat Bingo Hall, Poker Room and Off-Track Betting Room, the Casino offers thrilling action 24 hours a day, 7 days a week. The Casino also has a 500-seat theater that features world-class entertainment and five unique restaurants including, The Buffet, Dream Dance Steak, The Fire Pit Sports Bar & Grill, Menomonee Valley Food Court and RuYi. For more information, visit paysbig.com. Located in the historic Menomonee Falls Mill building in suburban Milwaukee, WI, Trivera Interactive is one of the region’s oldest and most respected Web development, e-commerce and marketing firms. Since 1996, focusing first on website design and development, and branching out into email marketing, search engine optimization and Social Media, Trivera has been helping businesses and organizations all over the world use its unique combination of smart design and creative technology to leverage the web as a powerful brand reinforcing tool. Trivera clients include General Mitchell International Airport, Usinger’s Famous Sausage, Frabill, RegalWare Worldwide, ZBB Energy and dozens of other local, regional and national businesses and organizations.